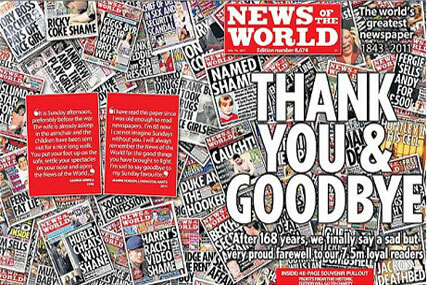 The News of the World has printed its final edition, signing off with the front page headline "Thank you and goodbye", and admitting the newspaper had lost its way. The closure brings one of the UK's largest media brands to an end. Britain’s best read paper finished its last ever print run after being a mainstay of the newspaper industry for 168 years and printing 8,674 editions. The recent allegations that it had hacked into the mobile phone voicemails of murdered schoolgirl Milly Dowler during a police investigation into her disappearance started a tumultuous week for the News International paper. It has also had to deal with subsequent claims that individuals working on behalf of the paper also hacked the phones of victims and families of the 7/7 atrocities. The allegations are now subject to an internal inquiry at the paper’s parent company News International, and Prime Minister David Cameron has also called for public inquiries into press ethics and the handling of the original inquiry by he poice. Today’s editorial faced the allegations head on, as a leader in the paper said: "Quite simply, we lost our way. "Phones were hacked, and for that this newspaper is truly sorry. There is no justification for this appalling wrong-doing. No justification for the pain caused to victims, nor for the deep stain it has left on a great history." The editor of the News of the World, Colin Myler, who took over from Andy Coulson when he resigned in the wake of the 2006 revelatons, spoke to reporters outside the News of the World's offices late on Saturday night, after the completion of the final edition of the paper. He said: "It is the 8,674th edition after 168 years. It's not a position that any editor would want, to close a title and, of course, I didn't close it. "I want to pay tribute to this wonderful team of people here who after a very difficult day have produced a wonderful paper. "It is a sad day for the staff. This is not where we want to be and not where we deserve to be." In a show of solidarity with his staff, he added: "And now in the best traditions of Fleet Street, we are going to the pub." The chairman and chief executive of News Corporation, Rupert Murdoch arrived at News International’s headquarters in Wapping, London, today to consult with senior executives over the allegations and the future of his Sunday tabloid offering in the UK, which is understood to include plans for a Sun on Sunday title. His meetings have included former News of the World editor and current chief executive of News International Rebekah Brooks, for whom Murdoch has pledged his "full support" concerning the phone-hacking allegations. Earlier this week, he called the allegations of phone hacking, "deplorable and unacceptable." Speculation has been rife regarding the launch of a new News International Sunday tabloid after "Sun on Sunday" was trademarked this week. The domain names thesunonsunday.com and thesunonsunday.co.uk were also registered by an unknown owner. The front page of the final News of the World thanked its "7.5 million" readers. According to the Audit Bureau of Circulation, the paper had an average net circulation of 2,657,232 between 2 May and 29 May 2011. Profits from the sale of the final edition of the News of the World will go to charity. Approximately 200 editorial jobs will go at News International due to the closure of the News of the World. This week advertisers including Ford, O2, Shop Direct and Boots decided to pull their advertising from the News of the World following the phone-hacking allegations. The allegations have also brought into sharp focus Rupert Murdoch’s bid to take control of satellite broadcaster BSkyB through his News Corporation media empire. The government has indicated it will delay its decision over whether to greenlight the deal and Ofcom has said it coudl revisit its "fit and proper" test for owners of broadcast licences following this week's developments.